Properties in Matapouri average 4.6 out of 5 stars. 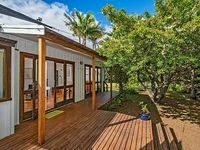 Property 8: Spectacular Woolleys Bay! Property 13: Stunning Ocean Views and close to the best beaches! 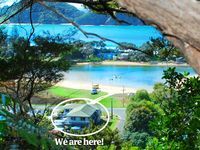 Property 19: Beach Life Matapouri - a minute's walk to Matapouri Bay! Mac's House Matapouri Bay by the Beach. Property 20: Mac's House Matapouri Bay by the Beach. Serenity Near The Sea - Large sunny and private. Property 33: Serenity Near The Sea - Large sunny and private. Friendly and helpful hosts, accommodation very tidy, and great for staying with wider family. Lovely waterfront view over the estuary. Fantastic property, big enough for a large family or cosy enough for two! Large open kitchen with plenty of equipment and cooking utensils. Very close to the beach, being only a couple of minutes walk. Bed was comfy and the property was clean and well looked after.